Get Naked in Our Private and Secluded Honeymoon Cabin! Ask about our great Honeymoon Specials! Arriving today? Call for last minute VRBO specials! Always and Forever is so private you can get NAKED in the hot tub and not have to worry if someone is looking. Always and Forever honeymoon cabin is nestled on a mountain ridge in the heart of the Great Smoky Mountains, just minutes away from Pigeon Forge, Gatlinburg and Cades Cove and provides a private peaceful location perfect for your romantic getaway or weekend escape. Always and Forever is a secluded one bedroom log cabin and features 2 fireplaces, oversized king log canopy bed, jacuzzi for 2, full kitchen/dining, large living area with 40inch HDTV with BLURAY, sofa and cozy love seat, game room with pool table, washer/dryer, and a hot tub big enough to soak all your cares away. Enjoy nature at its finest on one of three porches and decks, all the while listening to the creek run below. All of this just minutes away from action packed Pigeon Forge and Gatlinburg, your gateway to the Great Smoky Mountains National Park. This awesome romantic cabin is available with nightly rates or with deep discounts on our honeymoon packages with products provided by IsThat4Me, visit our web site to view! The 3 night 'add on' package includes: a romantic pleasures spa basket featuring honeydusting powder with feather, chocolate body paint, sensual suds and other chocolate surprises plus your choice of a sweetheart breakfast basket or a bed of roses. The 7 night package 'add on' package includes: a romantic pleasures spa basket, a candlelight steak dinner basket, fresh flowers, a custom embroidered afghan with the couples names and wedding dates, and a smoky mountain breakfast basket. Thank you for taking the time to write a review of our property. We are delighted to hear that you enjoyed the stay and the cabin. We look forward to you staying with us again. My wife and I very much enjoyed your cabin. The shower alone was worth the drive. Comfy bed, well decorated and just minutes from everything, we cant wait to visit again. Always and Forever stay during July 4th week " 2016"
This was the most adorable cabin, it's decor was awesome. My husband and I relaxed more this week than we ever had on vacation, we had all the privacy you could possibly ask for, in a cabin. You had a choice between three wonderful decks to relax on, a awesome "Hot Tub" to relax in, and all the privacy!! The cabin was so "clean and cozy", it was well stocked with amenities, we didn't even use everything after staying a whole week. Everything was so close, the cabin was only 7-10 minutes, from the main parkway in Pigeon Forge. There are "2" grocery stores, less than 10 minutes away from the cabin, and we were so convient to all activities that Gatlingburg and Pigeon Forge has to offer. We will stay in this cabin again!! We had the best vacation Ever!! We enjoyed the location and privacy of this cabin. The bed was very comfortable. There were some things that needed repair but they were minor. It was a nice getaway. Me and my wife spent our honeymoon in the Always and Forever cabin and it was amazing. Our wedding cabin was a disaster so it was such a relief to come to this cabin. From the drive up the gated driveway to the amazing steam shower there was no disappointment. 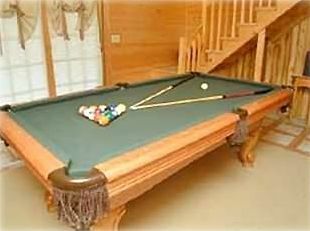 The location was close to pigeon forge but was as private as you could ask for. We loved the kitchen. The front and back decks where perfect for relaxing. It was also great to be able to bring our dog with us.Can't wait to come back and stay again. This will Always and Forever be our anniversary cabin. Thanks for a unforgettable honeymoon. My husband and I stayed here for a long weekend and could not have been more pleased! We have rented a lot of cabins and are always in search of one that is private without other cabins right on top of you and so far this is the most private one we have found. We didn't do much for four days other than sleep in, watch movies, eat good food and enjoy the pool table and hot tub and it was wonderful! The cabin is super clean and has everything you need. It was totally private at the dead end of a gated drive but yet it was so close to everything. It only took about 5-10 minutes to get out to the main drag in Pigeon Forge. One of my favorite things about the cabin was the awesome huge tile shower with 3 giant shower heads and steam! I could have sat in there with the steam for hours. If you are looking for a great place to relax that is peaceful and quiet look no further. We will definitely be back!